Our quest for new wines continues this week, with a chenin blanc/chardonnay blend that looked like a great wine to try. The cheese we chose to pair with it, Quesos Deleite, is actually made right next door to where we are staying. We’ve seen them receiving raw milk on the loading dock and working away, but haven’t had a chance to go inside yet. Do you like Chenin Blanc or Chardonnay? Have you tried a blend of the two? 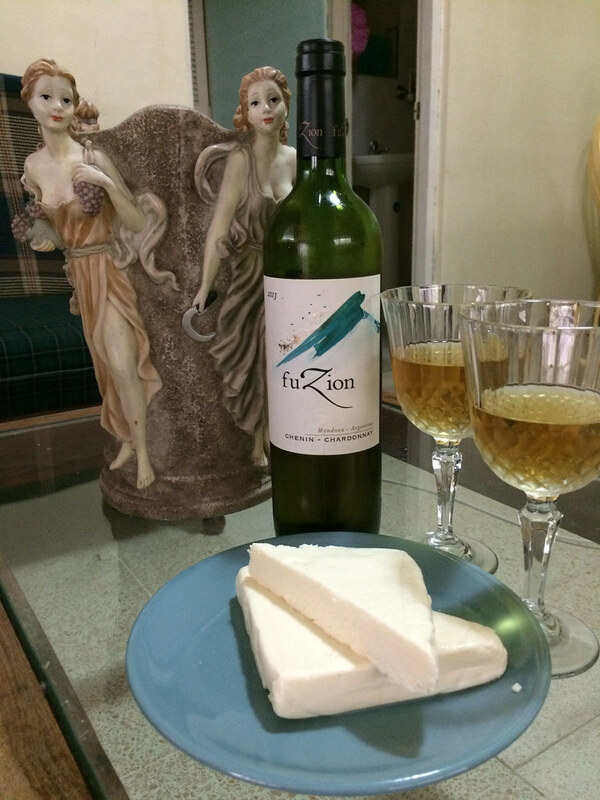 Read on for our review of this new-to-us blend paired with the fresh Quesos Deleite. We swirled the glass to figure out what aromas this unfamiliar blend had. I noticed a honey sweetness, black licorice and petrol aromas. Neil picked up a lemon butter aroma similar to a glaze you would use when preparing fish. We were both a bit confused by these notes. Once we tasted the wine, we identified similar flavors to our aromas. This wine seemed to be kind of sweet but also tart. It reminded me of the flavor of a honey throat losenge. Neil also found it to be a bit floral with a lingering flavor. We weren’t really sure about our opinion of this blend. The cheese is similar to the fresh cheeses we found in Costa Rica. 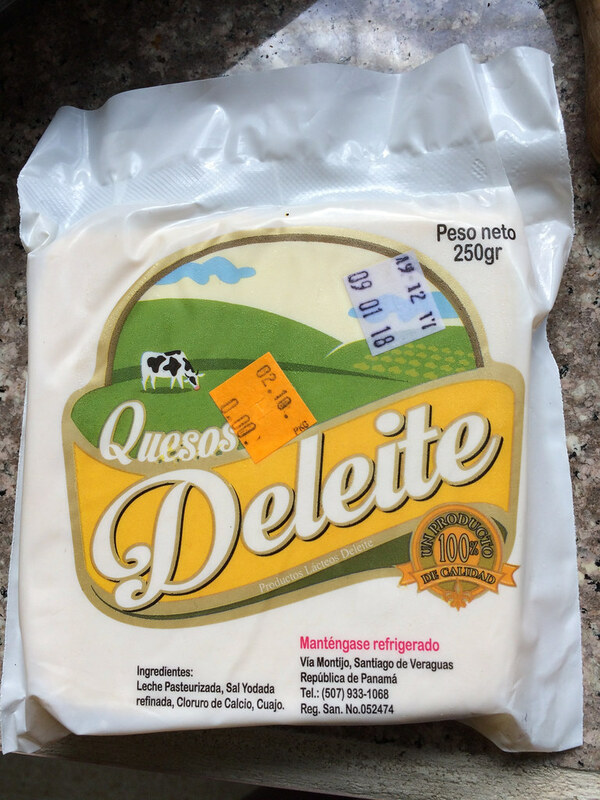 We tried Quesos Deleite when we first arrived as a side dish for breakfast. It was just ok then, but we figured we’d give it another go with some wine to see how the flavor changed. It smelled like funk and salt but it was pretty mild. Neil felt there was a good amount of grassy funk aroma and fresh milk. During the tasting we realized it had a texture similar to ricotta, which took away some of the uncertainty about it. It is a bit of an unexpected texture though since it clings to the inside of your mouth and can be spread on bread. The cheese had flavors of fresh milk, grass, and a hint of funk in the finish. We agreed that it tasted much better this day than the other times we’ve tried it. We think this was due to us opening and enjoying it right away instead of waiting a few days. And now the true test, do any new flavors appear during the pairing of this wine and cheese? The wine had a more tart lemon flavor and kind of burned when it went down my throat. There was a bit of cheese on my finger so I tasted it and it reminded me of an Italian cheese flavor. The cheese seemed sweeter and made me think of a cannoli. It was like the sweeter wine transferred some sweetness to the cheese. Neil thought the cheese became more interesting with some butter flavor and less funk. He didn’t notice much of a change in the wine. That’s 2 votes for a good pairing, these two are definitely better together than apart. After this strange wine tasting experience, we investigated a little further. The wine vintage was 2013 and the color was dark yellow. Could this wine be a bit old? It did taste kind of like a Sauternes, which is the only older white I’ve ever tried. Neil tried it with a buttery fish meal that evening and thought the flavor worked better than drinking it by itself, but I still didn’t like it. We eventually ended up dumping the wine down the sink. In order to continue learning about this blend of chenin blanc and chardonnay, we purchased a second bottle of a different brand and newer vintage (2016). The second bottle was completely different. It reminded me of pinot grigio with pear aromas and possibly petrol but I think it was more the aroma of minerals. 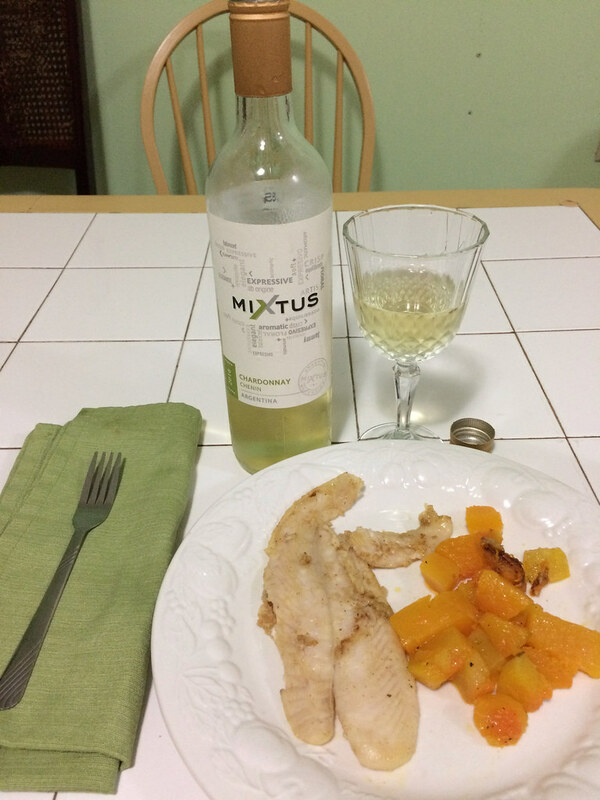 The wine was crisp, with citrus flavors and a hint of softness. Neil identified daisies and apricots with a fresh, crisp flavor. There’s no question that this bottle of Chenin Blanc/Chardonnay was much better! Perhaps my homework assignment is to try a pure chenin blanc wine? I’ll keep that in mind the next time we are at the store. Next Post: Rioja with Sheep Cheese, A Little Piece of Spain!